Today, more than 16 years of space-weather data is publicly available for the first time in history. The data comes from space-weather sensors developed by Los Alamos National Laboratory on board the nation’s Global Positioning System (GPS) satellites. The newly available data gives researchers a treasure trove of measurements they can use to better understand how space weather works and how best to protect critical infrastructure, such as the nation’s satellites, aircraft, communications networks, navigation systems, and electric power grid. Extreme space-weather events have the potential to significantly threaten safety and property on Earth, in the air, and in space. For example, the hazard of increased radiation exposure from charged particles released during a large solar flare could require that flights be diverted away from a polar route. Similarly, sudden bursts of plasma and magnetic field structures (coronal mass ejections, or CMEs) from the sun’s atmosphere and high-speed solar wind could significantly disable large portions of the electric power grid. The resulting cascading failures could disturb air traffic control, disrupt the water supply, and interfere with life-saving medical devices. The Los Alamos-GPS sensors continuously measure the energy and intensity of charged particles, mainly electrons and protons, energized and trapped in Earth’s magnetic field. These trapped particles form the Van Allen radiation belts, which are highly dynamic—varying on time scales from minutes to decades. From GPS orbit (roughly 12,600 miles above Earth), satellite-borne sensors probe the largest radiation belt—consisting mainly of energetic electrons. Each of the 23 sensors in the current GPS constellation makes detailed measurements of the belts every six hours. Together the sensors provide 92 complete measurements of the belts every day. The newly released measurements constitute a nearly continuous global record of the variability in this radiation belt for the past 16 years, including how it responds to solar storms. The data provides an invaluable record for understanding radiation-belt variability that is key to developing effective space-weather forecasting models. Los Alamos has been anticipating greater awareness of the nation’s vulnerability to space weather since the 1990s, when it began aligning its space-weather research activities with its critical-infrastructure program. “This led to an awareness that we could expand the utility of our space-weather data to programs beyond the specific requirements they were designed for,” said Kippen. 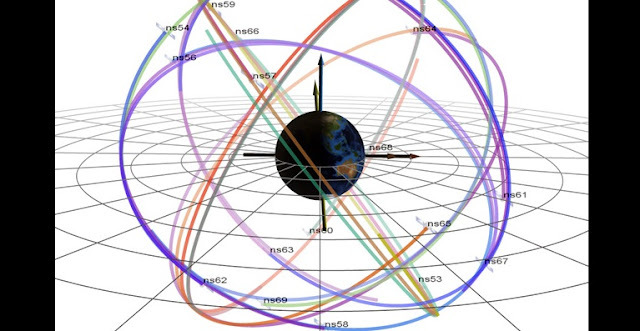 The Los Alamos-GPS sensor data is hosted by the National Oceanic and Atmospheric Administration (NOAA), or by searching for “GPS Energetic Particles” at https://data.gov. The sensors are supported by the Department of Energy’s National Nuclear Security Administration. A feature article providing an overview of the data was published today in Space Weather, a journal of the American Geophysical Union, as well as commentary by the Editor-in-Chief of the Space Weather journal.